We all love bees, or do we? As for their honey, we can’t get enough of it…. BUT they sting if annoyed or the weather is about to change. Bees need to be looked after and that can take a lot of time. 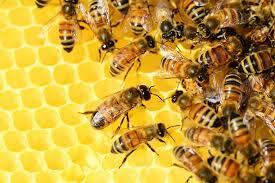 They also are prone to disease and predation so if you think you would like to keep bees, first join a local society. It’s the best way to learn the pros and cons of beekeeping. Often classes start late winter. Unless you can obtain equipment second hand, two new hives, bees, basic equipment and extracting equipment, will cost around £1000. Ouch! (and you have not been “stung” yet). Perhaps it’s better to help the bees in other ways and think about keeping them later. Having been around for over 100 million years, they are very tenacious and adaptable creatures. Unfortunately for them, man loves honey and has managed to husband them with some degree of success. That is until they decide to swarm despite the best efforts of the beekeeper, and whilst it is a great sight to see a hive of 30,000 or more bees leave your hive and disappear at the speed and sound of a jet, off into the far distance, one wonders if it is worth all the trouble. Yes it is, because you can help the planet to survive man’s overpopulation and stupidity and with care, enjoy the produce, wax and honey. One might think because we live in Sarratt and the country, bees would do well and generally this is more or less correct. The main problem is most of the farms around here only produce mono crops, which often do not need bees to pollinate the crop. What the individual can do is not to tidy everything up and have super smart gardens. Only prune hedges when absolutely necessary, especially if they contain flowering plants, such as hawthorn, wild roses, etc. Growing Ivy is great as it flowers late autumn/winter and is an essential food source late in the year for bees. Just prune them early spring. If you can, leave a patch of garden uncontrolled, or turn it into a wild flower area. 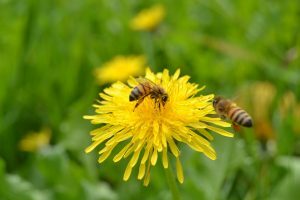 It has been noted that bees taken to pollinate fruit orchards, often prefer the dandelion plants to the fruit trees! So let them grow and enjoy the flowers as well. The bees certainly will. Plant spectacular trees, “conkers”, willow, lime, heaven for bees. For a list of suitable plants, just pop “bee friendly plants and trees” into your search engine to see what you can grow. Bees also need a lot of water, so if you have a pond, put a piece of wood or a small lily in the water so they can land and “top up” whilst flying and collecting nectar, it acts as a great and necessary service station on their flights. Now for the good part… If you do get stung, it is thought that it can help offset arthritis, so don’t blame the bee, just thank her. In fact, there is research by some doctors, who under controlled conditions, use bee stings to treat patients. Ouch, again. If you are unlucky enough to get stung, it is very rare to have a nasty effect, although it can be painful for a while. Keep a tube of anti-histamine in the house or when you venture outside as the sooner you can apply a good dollop on the sting site the better. Enjoy our great outdoors and if you see and hear bees about their work, leave them to it and offer up a little prayer for being able to enjoy these wonderful creatures. It would be a dull world without them.